DDWES - Wedding & Event Hire Services For Gloucestershire & Beyond. Based in Gloucestershire we have been providing a wide range of products and services to the wedding and events industry for a number of years. We specialise in providing unique and interesting products that enhance the look of any Wedding. We love a venue transformation project, particularly for a wedding in a village hall. Our range of wall drapes is a fantastic way to change the look of a venue. The magic mirror is ideal for corporate events as well as weddings, proms and birthday parties. The software we use allows us to customize backgrounds to your requirements from company logos to wedding hashtags! We’re a “one stop shop” for all of your wedding and event requirements. From furniture to finishing touches we can help bring your ideas to reality. Providing Quality Equipment Hire at Affordable Prices. DDWES can provide you with a wide range of fantastic products and services for your wedding or event. We were established in 2007 and have worked on over a thousand events in that time. If it’s some finer touches for your ceremony or some “wow” factor for your evening reception we can certainly help, we love a wedding! We also enjoy working on corporate events with our magic mirror being very popular! Our Magic Mirror Photobooths have become hugely popular for wedding and events. Using a full length touch screen you can select options, add emojis and even sign your creations. We also bring along props to help create some “wacky” photos. We also provide instant prints and digital copies as well! Choose from our range of bespoke floors. 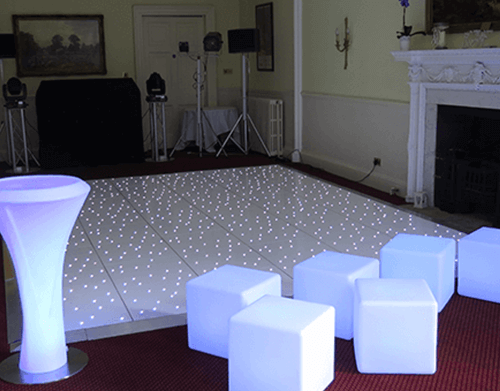 Bring the “wow factor” to your event with our groovy LED dancefloor! Hire our eyecatching light up LOVE Letters. Compliment your venue with our ambient wash lighting. Perfect for incorporating a colour theme to your event. Transform your venue without blowing the budget with our wall drapes. Ideal for Weddings. The Magic Mirror is this years must have photobooth for any event. Interactive touch screen. Follow our news blog to Keep up to date with the latest goings here at Deckstar Deluxe. Please do get in touch to book an appointment with us to discuss your requirements using our online enquiry form. 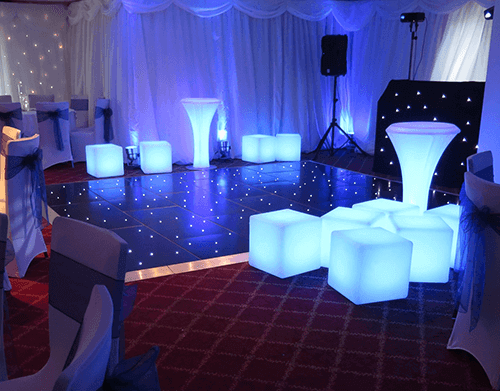 A Wide Range of Dance Floors for Hire to Suit Every Requirement from a Leading UK Stockist. DDWES can provide a wide range of dance floors in various sizes, shapes and colours to suit all requirements. Based in Gloucestershire all of our dancefloors have industrial standard locking mechanisms, so no matter how enthusiastic your dancers may be, the floor will remain locked and secure. All floors are thoroughly cleaned prior to each event to ensure they not only arrive in pristine condition, but also add a huge ‘wow factor’ for your guests on arrival! Why not browse through our extensive range of styles below, including Starlight, Traditional Wooden Parquet and even our Night Fever inspired LED dance floors for the true 80’s effect!